ID photography is one of the main activities and major profit sources for many photo labs. Making a good choice is essential when it comes to ID photo software. The program must be reliable, convenient, and ensure professional quality output. myPhotoLab suite includes Passport Photo Maker which proved to be very popular among professional photographers in many countries. This app makes preparing and printing excellent quality ID photos a matter of minutes. It lets you make photos for national passports and travel documents, driving licenses, student cards, etc. There is a regularly updated database of ID types for different countries. 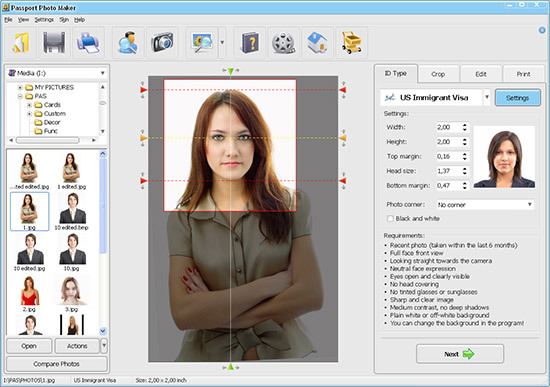 Passport Photo Maker was carefully designed to simplify every aspect of your work. Everything is fully automated - from biometric features detection to printing sets of photos. 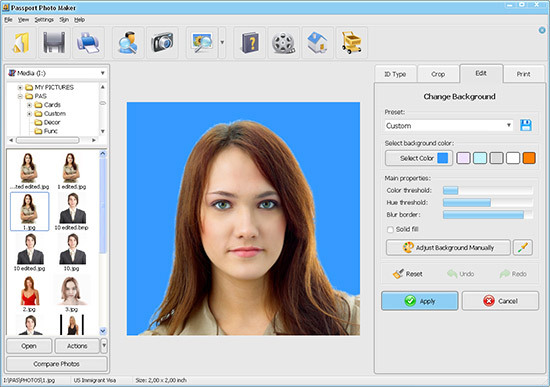 The built-in photo editor provides professional tools for photo retouching and enhancement, as well as automatic background change feature. The print module lets you be flexible with print layouts to help you save on printing costs. It is also possible to save a print layout and burn it to a CD. There is a set of tools to assist with accounting: set the prices, store order data automatically, see and export order stats. The manager can have full control over all activities by setting a password to access certain operations and checking the software log. Passport Photo Maker will create a perfect base for your daily work, making sure you have a stable flow of customers. I started using your software in my photo lab, and it has amazingly changed the way we work. So many operations are automated now - it helps the staff serve customers faster and leaves more time for creative things. We've introduced some new services, calendar and poster design among them. Profits up and happy customers - I'd never think that new software can do so much for my business! Thanks for this wonderful software, this is sooo much easier and intuitive than other software I have used in the past. There's absolutely all I need for my wedding photo studio, and it's quite pocket-friendly unlike most professional photo software. With your endless templates I can create unique portraits and photo montages, and the prints are perfect quality. suite for your photography business!